Debra Sparrow was born and raised on the Musqueam Indian Reserve and is self-taught in Coast Salish design and jewelry-making. Originally, she focused on Coast Salish graphic design and jewelry when in 1983, she joined a class of women in Musqueam which focused on the revival of Salish textiles. She has since been combining textile and Salish designs in a contemporary way through geometric, hand spun blankets and wall hangings and murals. 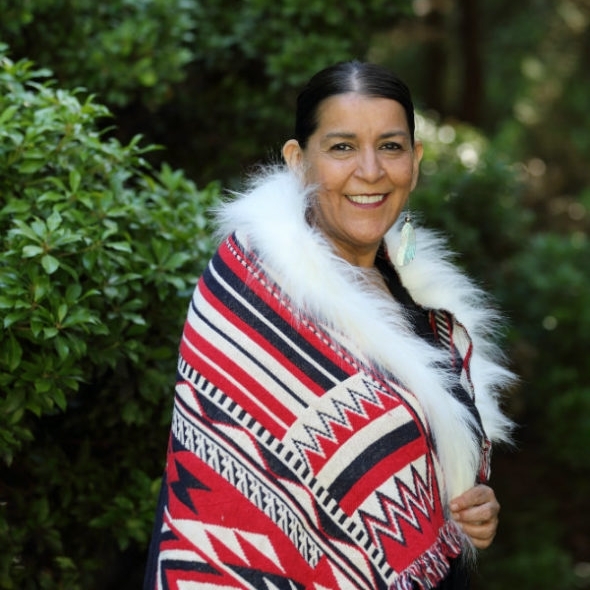 Debra is an acclaimed weaver who has been weaving for twenty years and is deeply involved with the revival of Musqueam weaving. Her Musqueam blankets are displayed at the Vancouver Airport, and at a number of locations on the University of British Columbia, Vancouver campus, including the Museum of Anthropology. Her work has been collected by a number of private collectors and public institutions. Debra collaborated with Nike and designed the logo for the Canadian Men’s Hockey Team for the 2010 Olympic and Paralympic Winter Games in Vancouver, B.C. She also continues to work on pieces close to her heart at her home in Musqueam. It is Debra’s hope to educate others about the beauty and integrity of her people’s history through her art. 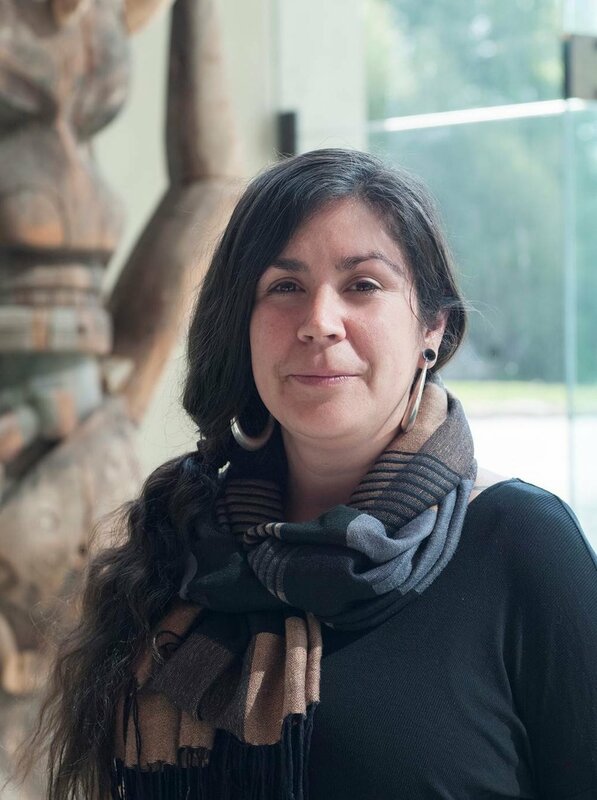 Tania Willard, Secwepemc Nation, works within the shifting ideas of contemporary and traditional as it relates to cultural arts and production. Often working with bodies of knowledge and skills that are conceptually linked to her interest in intersections between Aboriginal and other cultures. Willard’s art making practices are diverse and always politically engaged. They range from community engaged mural making to work that challenges colonial perspectives on land, language and culture. A personal curatorial project includes the BUSH gallery, a conceptual space for land based art and action led by Indigenous artists. Willard has worked as a curator in residence with grunt gallery and Kamloops Art Gallery. Willard’ curatorial work includes Beat Nation: Art Hip Hop and Aboriginal Culture at the Vancouver Art Gallery (2011), CUSTOM MADE / Tsitslem te stem te ck'ultens-kuc at Kamloops Art Gallery (2015) and co-curation Unceded Territories: Lawrence Paul Yuxweluptun at the Museum of Anthropology (2016) and LandMarks 2017/Repères 2017 in National Parks. Shawn Hunt was born in Vancouver Canada in 1975. He is an artist of Heiltsuk, French and Scottish ancestry. Shawn has a diploma in studio art from Capilano college as well as a BFA from the University of British Columbia where he majored in sculpture and drawing. Shawn comes from a family of artists. His father is Bradley Hunt, a prominent Heiltsuk artist with whom Shawn apprenticed for 5 years, learning wood and jewelry carving as well as traditional design. Shawn’s brother Dean Hunt is also an artist. Shawn apprenticed with Coast Salish painter Lawrence Paul Yuxweluptun from 2012 to 2015. Recently Shawn Hunt has undertaken a creative collaboration with Microsoft on the Transformation Mask. It features Microsoft HoloLens, creating an experiential sculpture engaged with mixed reality. The mask appropriates the traditional aspects of metamorphosis with the transformation from bird mask to human, yet in this adaptation the human mask has been altered, upgraded and merged with the machine. Incorporating technology, sound, and space, each part of the work reflects Hunt’s interest in how we understand and identify with the term Indigenous. Shawn Hunt exploring authenticity and challenges our expectations of what it means to be Indigenous. Gu Xiong, a multimedia artist from China, now lives in Canada. He is an expert in painting, drawing, printmaking, sculpture, photography, video, digital imagery, text, performance art, and installation. He has exhibited nationally and internationally including more than 40 solo exhibitions and three public art commissions. He has participated in over 100 prominent national and international group exhibitions. His work is represented in the collections of the National Gallery of Canada, the China National Museum of Fine Arts, and the Vancouver Art Gallery, among many other museums and private collections. Gu Xiong has done three large public art projects in Canada and the United States: the Safeco Field, Washington State Major League Baseball Stadium (Seattle, WA); the Seattle Public Library Columbia City Branch (Seattle, WA); the Macdonald Stewart Art Centre Donald Forster Sculpture Park, University of Guelph (Guelph, ON). Gu Xiong has published two books, over ten solo exhibitions catalogues and eleven book covers. In the capacity of curator, Gu Xiong has organized critically acclaimed exhibitions of work by emerging artists in Canada and China. Gu Xiong’s practice centres on the creation of a hybrid identity arising from the integration of different cultural origins. Through the critical angle of visual art, his work encompasses sociology, geography, economics, politics, and literature, as well as the dynamics of globalization, local culture and identity politics, through which he constitutes an amalgamation of multiple cultural histories and seeks to create an entirely new identity. The construction of a new level of being is Gu Xiong’s primary interest. As Professor in the Department of Art History, Visual Art and Theory at the University of British Columbia, Gu Xiong teaches and researches in the disciplines of installation, painting, drawing, photography, and contemporary art theory.